The United Nations World Tourism Organization (UNWTO) proclaimed 2017 the International Year of Sustainable Tourism for Development. In concert, Taiwan is implementing a 4-year program with special tourism themes for each year, with 2018 the Year of Ocean Bay Tourism. Ten offshore islands are being specially promoted as part of this big push, and before you hit their shores in person we offer you “sneak preview” visits in the pages to follow. 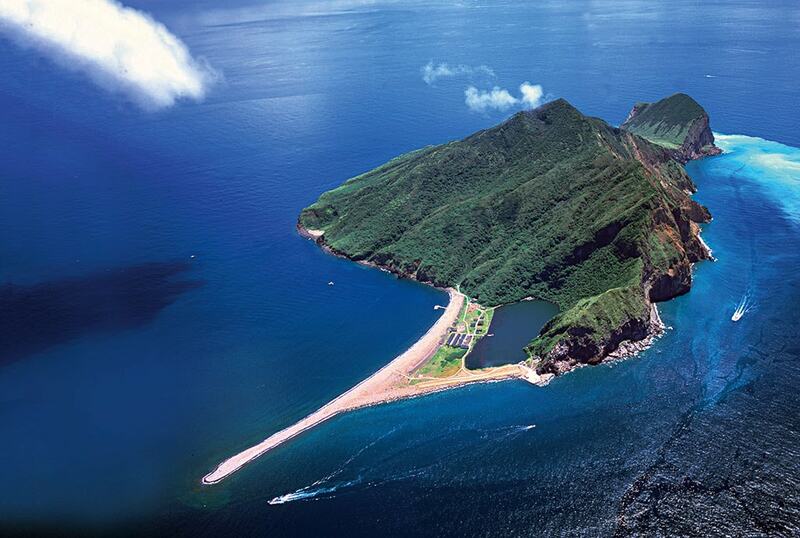 Taiwan is blessed with a treasure fleet of adventure-perfect offshore islands. Its superb transportation network makes all easily accessible, each “little Taiwan” experience just a hop, skip, and jump away from the big island. Each is a world unto itself – even those within direct sight of another member of the flotilla. Each is a veritable “living theme park” floating in the sea, just-right designed for a single- or two-day visit before moving on to the next. Collectively, the fleet constitutes an island “family” that is much like big-house human families, with a startling range of contrasting individual personalities living under one big roof. What is commonly shortened to simply “Penghu” is a wide-flung archipelago of low-lying islands in the Taiwan Strait’s mid-section. This was a key regional crossroads in the days of sail, including for pirates. Locals describe Penghu as “pearls scattered on the turquoise sea.” This is a slow-moving realm of old villages, old temples, old lighthouses, and old fort ruins. Small farm plots are protected from the famed winter winds that blow down the strait by low coral walls. The three main islands (of which Yuweng is one), connected by bridges, form the outer walls of a comparatively calm inland sea. Sail sports are popular on the water, scooter/bike touring on the land. The archipelago is rocky, with massive formations of exposed volcanic basalt columns prominent and seascapes dramatic. Boat tours to the outlying islands are popular, as are nighttime squid-fishing outings. 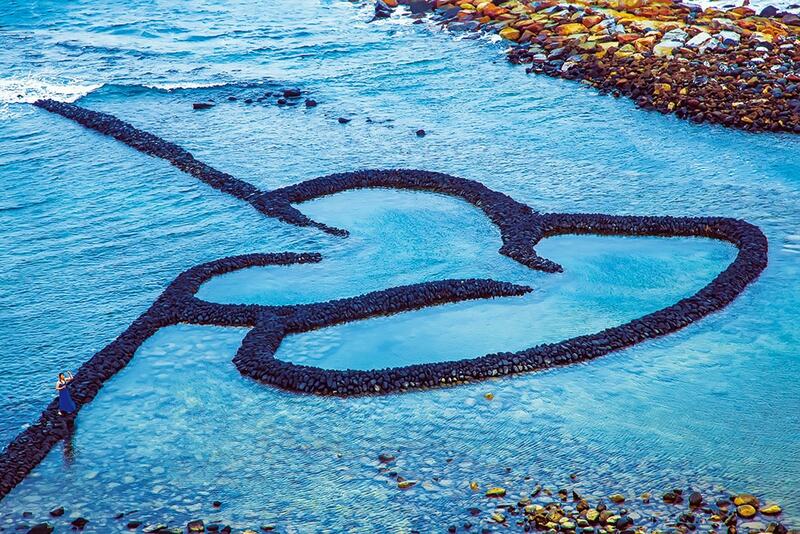 This is the westernmost of the three main islands, and second-largest in the Penghu archipelago. In the 1500s the Portuguese dubbed the archipelago the Pescadores, or “Fishermen’s Isles”; Yuweng means “fisherman.” It’s also called Xiyu, or “West Island.” It is reached from its brethren islands via the celebrated 2,494m-long Penghu Great Bridge, perhaps Yuweng’s most prominent landmark. Underneath, the powerful sea current roars by at a speed of 3m per second. 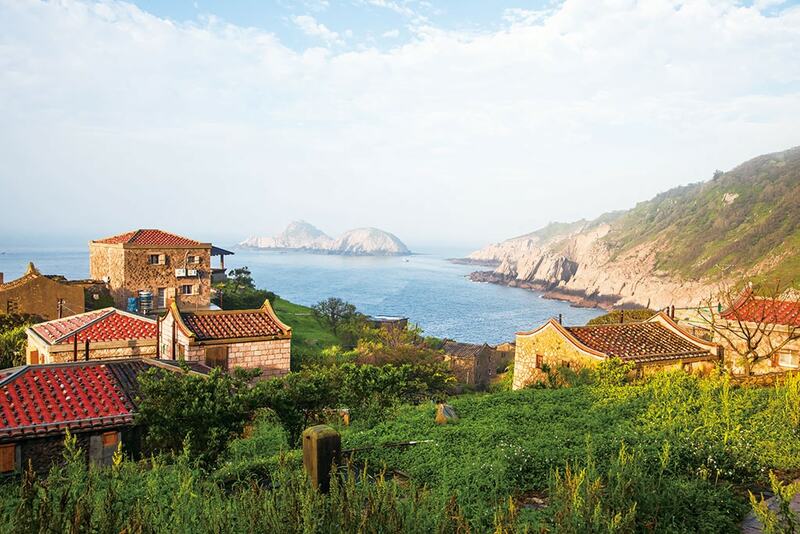 A highlight on this island for history buffs is tourism-oriented Erkan Village, a dense collection of heritage residences in the old southern Fujian style of mainland China. Living-museum examples of old-time rural life such as Qing-era scales and weights, oversized ceramic storage jars, and winnowing equipment abound. Other key Yuweng history sites are the forlorn ruins of the late Qing Dynasty-built Xiyu Western Fort, erected to protect against pirates and invaders, and at the island’s south tip Yuwengdao Lighthouse, the first lighthouse built in the Taiwan area, way back in 1778. 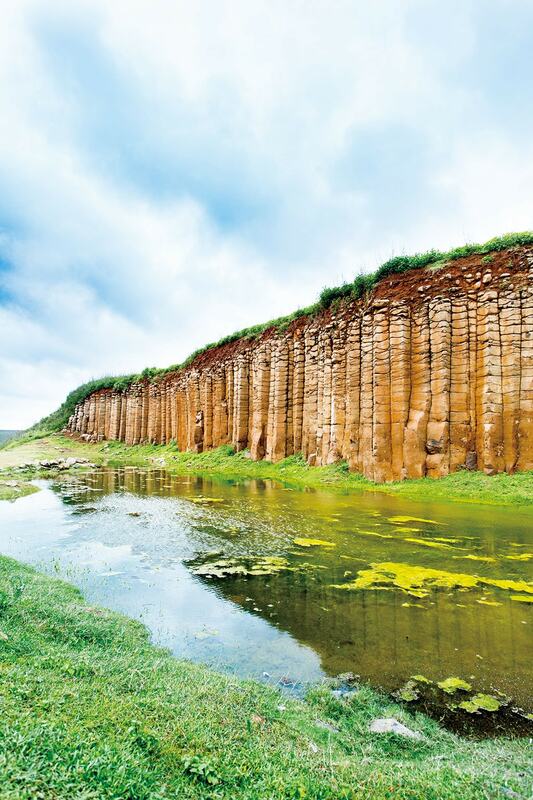 On the check-off list for geology enthusiasts are some of the main islands’ most impressive basalt-column formations – the Daguoye Columnar Basalt, Secret Three Stone Walls, and Chixi Rock Waterfall – located close together in Xiyu’s mid-section. The first faces the inland sea, with a sweeping view toward small Magong city far across the water (the islands’ largest settlement and main port of entry). The second is a triumvirate of column-walled dead-end canyons dug out of the island’s farmland-dotted plateau. The third stands before an abandoned coast-side fish farm teeming with sea cucumbers, eels, crabs, and other marine natives. Elsewhere, on a tiny fishing-village island just a few anchor-widths off Yuweng’s north end is Whale Arch, a sea-holed basalt-column promontory that resembles a prodigious sperm whale. Legend says that the Tomb of the Seven Beauties – “Qimei” means “Seven Beauties” – is built around a well down which intemerate Ming Dynasty damsels tossed themselves as ne’er-do-well wako pirates sailed in. Among the other locations to be checked off any “I did Qimei” list are Little Taiwan and Waiting for Husband Rock, coastal rock formations proved indubitably worthy of their monikers when viewed from the coastal-road observation decks, perched clifftop high above the crashing surf. This getaway isle for fun and frolic, on golden sands and atop sparkling azure waters, is promoted as an “international water-recreation paradise.” Moored to the north of the main islands, this is a destination where those who can’t relax without boys’ toys can indulge themselves. Whatever tickles your “fun-need” bone is surely to be found on Jibei’s “I’ll try anything once” menu. The resort at Jibei Sand Beach, a brobdingnagian tongue of fine coral/shell sand that spits out 1,500 meters into the sea and grows/shrinks markedly with the tides, has windsurfing and snorkeling gear, jet-skis, and paddleboats for rent, under-the-sea sightseeing-boat and speedboat outings, and a waterworld of other activities ranging from parasailing to family-fun banana-boat rides. And oh yes! – pursue such old-time toy-devoid pursuits as sun-tanning and regular ole swimming as well. On two entirely different theme-fronts, Jibei is known as Penghu’s “home of stone weirs,” with over 80 stone weirs awaiting your treasure-hunt discovery; Penghu is an important center for the protection of sea turtles, the sands of Jibei and other archipelago locations site of important nesting grounds. For more information visit the Penghu National Scenic Area website at www.penghu-nsa.gov.tw. 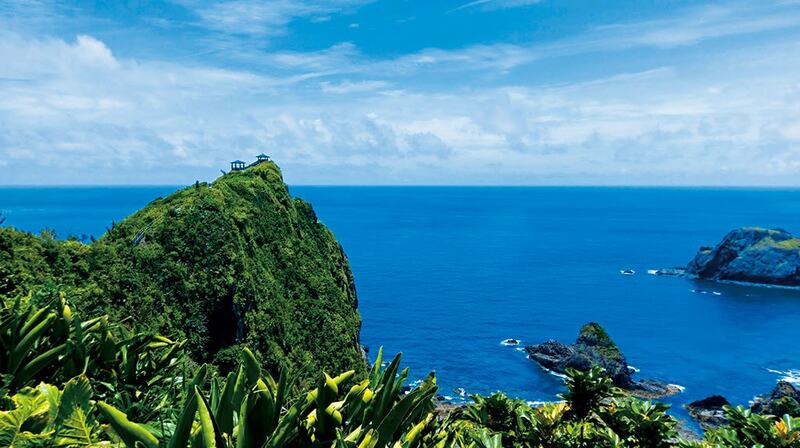 The Matsu Islands, far to Taiwan proper’s northwest, are the Republic of China’s northernmost possessions. The mountainous mainland China coast – Fujian Province – is clearly visible from many Matsu locations, along with its busy coastal shipping traffic. The sparsely populated islands are (primarily) massive granite outcrops that rise abruptly from the sea. Flat land is precious, and the wildly indented coastlines, geologically twisted and tortured, are dominated by soaring cliffs. Good harbor inlets and bays are scant. The keynote Matsu Islands touring themes are the PRC/ROC cold-war military history and ubiquitous military fortifications (many now tourist sites); traditional East Fujian stone-residence and temple architecture, and cuisine, a world away from that found on mainland Taiwan; geological spectacle, most notably the dramatic seascapes; ferry-ride island-hopping; and teeming, swirling migratory-bird colonies. Beigan and Nangan, a quick ferry ride from each other, are Matsu’s two largest islands. 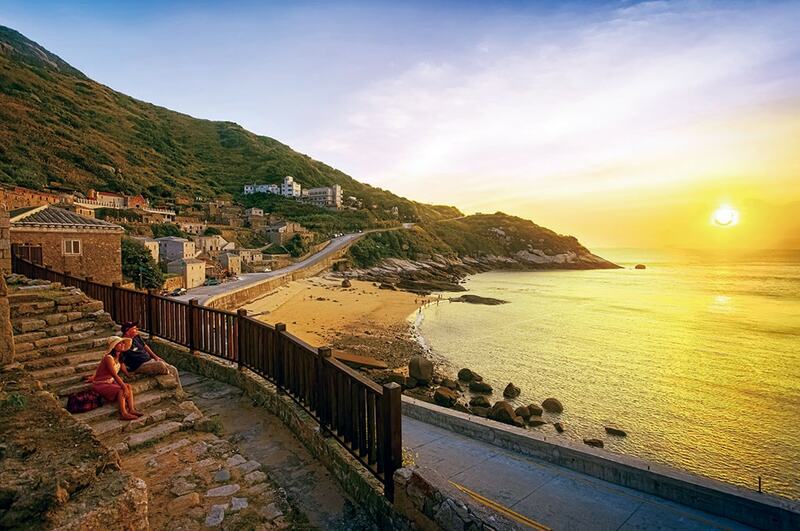 Beigan’s Qinbi, Matsu’s most popular old stone-house fishing village, resembles an old Mediterranean hill-clinging settlement. Residences are two-storied, the second floor providing sea views and breeze access. The bastion-like designs are not accidental – pirate attacks were long common. There are numerous coastal walking pathways on Beigan. Luoshan Nature Trail, blazed long ago by oyster gatherers and fishermen, begins on a small mountain behind Beigan’s tiny airport and ends far down – and out – on a narrow bare-rock promontory, ocean waves pounding its three faces. Along the way, visit the abandoned military-facility Stronghold No. 12 and brightly-lit War and Peace Memorial Park Exhibition Center (good English information), with displays on Matsu’s modern military history. The sparsely populated township of Juguang, south of Beigan/Nangan, consists of two major islands, Dongju (“East Ju”) and Xiju (“West Ju”). Most tourist draws are on the former. Tiny Dapu Village is another timeless Matsu stone-residence showcase. For a time completely abandoned, with Matsu National Scenic Area Administration support a renaissance is currently underway, with artist-in-residence, homestay, and other enterprises blooming. Dongquan Lighthouse, topping Dongju’s northeast-corner cape, is informally called the “Red-Hair Lighthouse.” The term “red-hair” was a common regional term for Westerners in imperial days after the Dutch sailed in. The soaring tower, built in 1872, guided foreign vessels into the nearby China mainland’s Min River after Fuzhou city was opened to trade following the Second Opium War. Fuzheng Village, significantly larger than Dapu, is another old fishing village now experiencing revivification, its scores of tier-stacked houses, harbor-moored fishing craft, beached hulks, cold-war-era retired US-built tanks on display, flaming-orange-red temple (the red symbolizing flames, meaning “too late” for real fires), and backdrop Dongquan Lighthouse together constituting a photographer’s dream-come-true. Dongju is also a prime venue for viewing the “Blue Tear” phenomenon, seen throughout Matsu, a surreal spectacle CNN has called one of the world’s 15 great natural scenic wonders. Local coastline waters sometimes glow blue at night, stimulated algae glowing with an electric-blue fluorescence. For more information visit the Matsu National Scenic Area website at www.matsu-nsa.gov.tw. This is a group of islands controlled by the Republic of China with its nearest point site of the Mashan Observation Station, just 1,800m from mainland China. 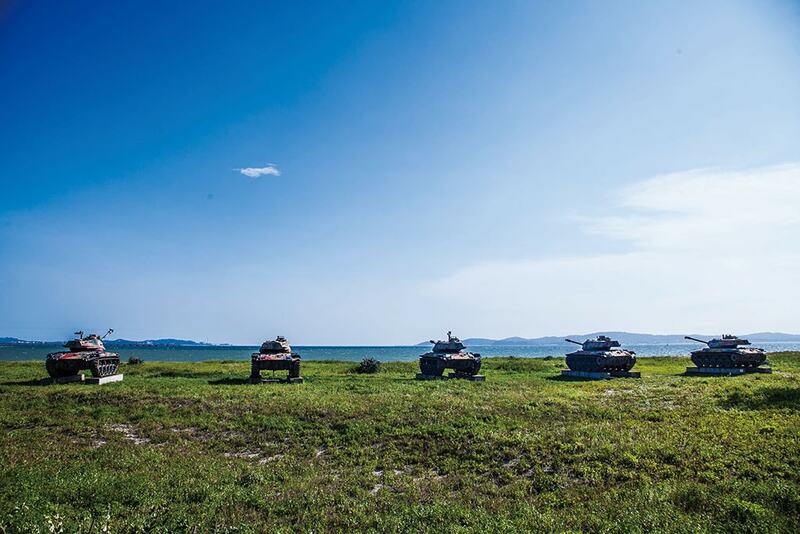 The military has a strong presence here, but with cold-war tensions now eased, tourism today stands on the frontline in economic terms, concentrated on the two main islands, Greater Kinmen and Lesser Kinmen. The islands are mostly flat and scooter/bicycle-friendly, and the countryside is dotted with well-preserved imperial-era clan villages featuring distinctive southern Fujian architecture. On Greater Kinmen is the islands’ main town, Jincheng, over 700 years old. Flagstoned Mofan Street, lined with souvenir shops, was built in 1925 in the arcaded Southeast Asia style by merchants who returned from that region. The graceful Chinese palace-style Qing Dynasty Military Headquarters, erected in 1682, houses a museum on Kinmen’s history. Elsewhere on the island is the Zhaishan Tunnel, an engineering marvel hand-hewn from solid granite in the 1960s, open to the sea and designed to shelter 40 gunboats used to defend the island. Shanhou Folk Culture Village, a clan village built in the late Qing Dynasty using money amassed in Japan trading, is a living museum with clanfolk still resident. There are also more than 100 Western-style colonial mansions in Kinmen, most built in the late 1800s/early 1900s by merchants returning after striking it rich in Southeast Asia and Japan. The Beishan Ancient Western-style House stands out – today abandoned, it was ripped apart by bullets during a major (repulsed) Chinese Communist landing in 1949. Two rewarding modern-era military museums are the Guningtou Battle Museum and August 23 Artillery Battle Museum. Two key sights on Lesser Kinmen, also called Lieyu, are the Hujingtou War Museum and Siwei Tunnel, reflections of their Greater Kinmen brethren. For more information, visit the Kinmen National Park website at www.kmnp.gov.tw. Coral-island emprise … water, water everywhere! 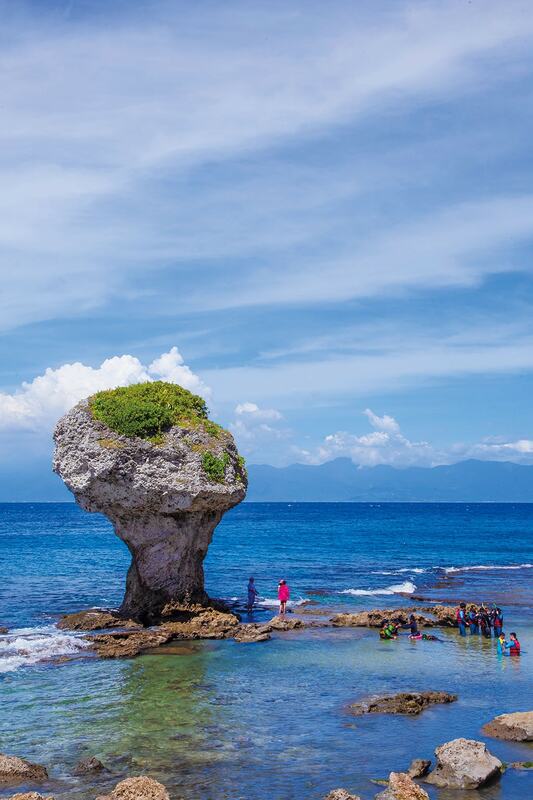 This island off Taiwan’s southwest coast just below Kaohsiung City, bobbing within easy sight of the mainland coast like some Brigadoon-like illusion liable to disappear upon one’s next blink, attracts both day-trippers and overnighters. Just 6.8 sq. km. in size, it’s made almost entirely of coral, and has a whimsical theatrical-set population of imaginatively named rock formations visited on scooter or mini-bus excursions along its coast-side loop road that includes Wild Boar Trench, Vase Rock, Beauty Cave, and Black Devil Cave. One of the many stories of explanation for the Black Devil Cave name is that it was a major site of abomination in a Dutch East India Company attack against the dark-skinned local natives in the 1600s. The island’s other main enticements are guided boat and glass-bottom boat tours, guided snorkeling experiences, guided tidal-zone eco-tours (notably the nighttime outings), and superb inexpensive seafood fare. For more information, visit the Dapeng Bay National Scenic Area website at www.dbnsa.gov.tw. 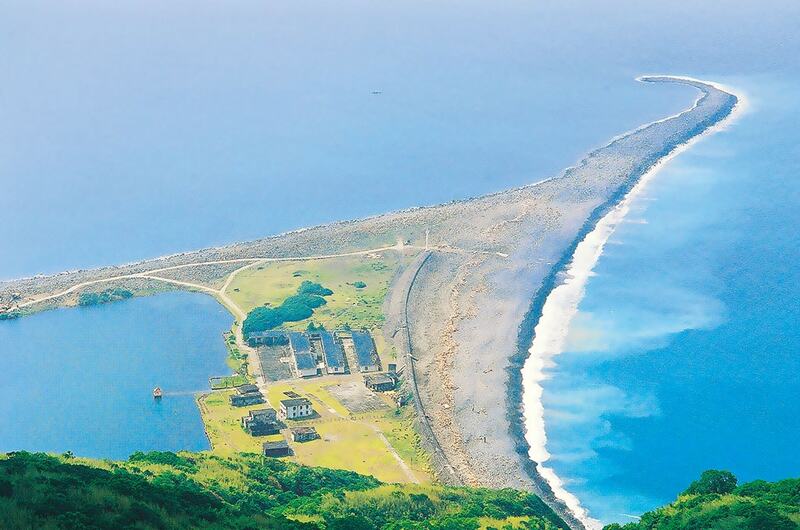 This volcanic island is, on a clear day, within easy view of upland points along the mainland Taitung County coast, seemingly floating in and out of view as your touring takes you on up and down mountain slopes. The island attracts visitors with its natural beauty. A friendly, easy-grade loop road follows the coastline of the island. You have a choice on arrival at the island’s point-of-entry settlement, Nanliao – ride the hop-on/hop-off tourist-bus service, or rent a scooter or bicycle. The bicycle excursion takes a half-day or more. The craggy coastline, since time immemorial subject of the Pacific Ocean’s sculpting talents, is a stellar geological exhibition of strange rock formations. Under the waters, the bright-colored reefs attract wave upon growing wave of snorkelers and divers. There are two good inland hiking trails, and caves near the coast awaiting exploration, notably Guanyin Cave, which has an underground waterway and a religious shrine dedicated to Guanyin, aka the Goddess of Mercy. The island’s claim to fame is the tourist-devoted facilities at the coast-side Zhaori Hot Spring (“hot spring of the rising sun”), one of the few saltwater hot springs in the world. Here, bathers are so close to the Pacific it feels as though ocean and pools merge. Sunrise worshippers are found sleepily, happily half-submerged here daily. Sounding an altogether different note is another prime attraction, a notorious long-closed complex for political prisoners dubbed “Oasis Village” by involuntary residents, today core of the Green Island Human Rights Culture Park. For more information, visit the East Coast National Scenic Area website at www.eastcoast-nsa.gov.tw. Lanyu strikes first-timers as an isolated haven where time may not have stood still, exactly, but where Father Time certainly only occasionally shows up to nudge the clock hands forward. This strikingly scenic volcanic island, larger than Green Island to the north, lies far out of view off the Taiwan mainland. Like its northerly cousin, it is formed of magma that long ago erupted from the ocean floor. Its high-mountain interior is thickly clad with rainforest. This was long a remote bastion of safety unknown to the outside world, home of the Yami tribe – also called the Tao – members of the great Austronesian diaspora, who form the majority of the 4,000-plus population. Their traditional culture is more intact than the cultures of Taiwan’s other tribal peoples, the result of greater isolation and, overall, better protection by officials after the Japanese, followed by the Han Chinese, landed on the island’s shores. There’s limited bus service, so most visitors rent scooters or bicycles at the ferry pier on arrival. A coast-side ring road takes you to the island’s six villages, where you’ll come across old-style semi-subterranean stone-and-wood dwellings (protection from heat and typhoons), brightly painted and carved oceangoing canoes made with not a single nail that are decorated with powerful protective symbols (they’re sacred, so don’t touch! ), and, on occasion, men dressed solely in traditional loincloths, for comfort and convenience, while fishing or at other tasks. Tourists also come for the snorkeling and diving, amongst the best in East Asia. 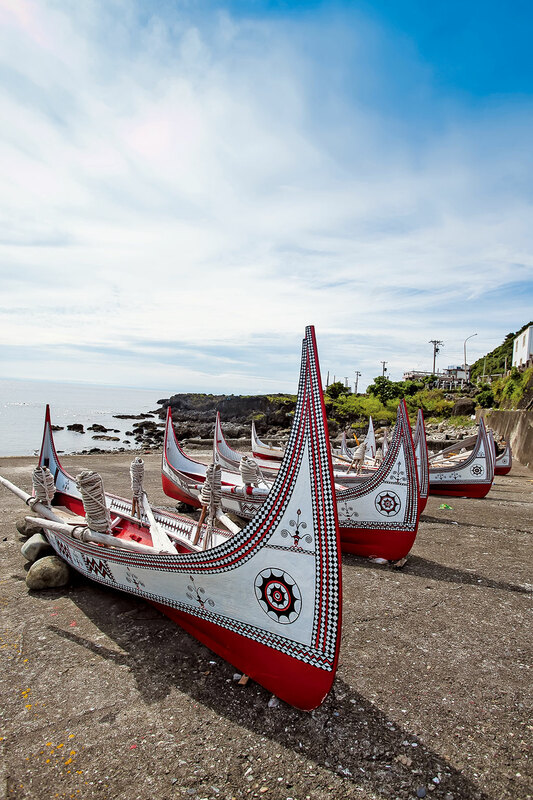 The Pacific’s mighty Kuroshio Current also delivers the island’s culinary staple, the flying fish, which you’ll see drying on racks ubiquitous in all the villages; be sure to join one of the guided flying-fish boat-tour outings. For more information visit the Taitung Travel website at tour.taitung.gov.tw. Yilan County is roughly triangular in shape, with mountain massifs framing the Yilan Plain (also called the Lanyang Plain) on two sides and the Pacific pushing against the third. It is bucolic, relying heavily on farming, fishing, and tourism, and has few conurbations and little heavy industry. Guishan (Turtle) Island floats just off the county coast, in view from almost all unobstructed points across the plain. The small volcanic outcrop, which does indeed resemble the exposed upper half of a giant sea turtle, is today uninhabited. Now an eco-preserve park, here you can visit the ruins of a century-old fishing village evacuated in 1977, inspect abandoned military facilities, and hike to the main summit for powerful sweeping looks in all directions. Access is via yacht tours from Wushi Fishing Harbor, during which you may spot dolphins and whales (there are also dedicated whale/dolphin outings with no island landing). For more information, visit the Northeast and Yilan Coast National Scenic Area website at www.necoast-nsa.gov.tw.